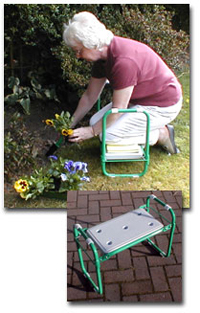 Help reduce those aches, pains and stiffness with the Chaselink Portable Garden Kneeler. Use one side as a kneeler, turn it over and you have a comfy stool. Durably made with a sturdy metal frame that will last for years. Depth 24.5cm/9.5" Width 54cm/21" Height 42cm/16.5"